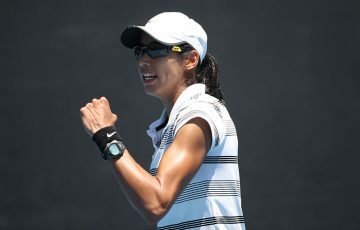 Priscilla Hon overcame a slow start in her quarterfinal clash with Zoe Hives in the Optus 18s Australian Championships this morning before surging home to a 7-6(4) 6-1 victory. 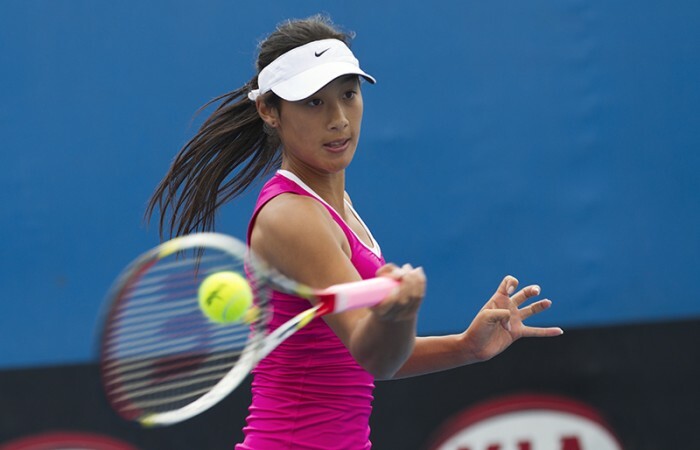 Fourteen-year-old Priscilla Hon battled her way through a first set slump to defeat talented Victorian Zoe Hives 7-6(4) 6-1 in the Optus 18s Australian Championships today. The win officially books her place in the semifinals where she will play in-form third seed Abbie Myers. 2012 Junior Fed Cup member Hives came out of the blocks firing, capitalising on a struggling Hon opening service game and raced to a 3-0 lead. Hon’s second service game was far more successful, only losing one point to get herself on the board at 3-1. Hon squandered break point opportunities in the next game, hitting her racquet into the fence several times in frustration at the match pulling away from her. At 2-5 Hon slowed the match down, bouncing the ball before serving and trying to get momentum back on her side. Her patience seemed to work. At 5-3 and serving for the set, Hives saved five break points but failed on the sixth, sending her ball into the net and getting the match back on serve. The girls remained evenly matched for the next three games, sending the opener to a tiebreak. It was Hon who would come away with the goods, eventually sealing the first set 7-6(4). Hives was clearly not disheartened following her opening set defeat, immediately breaking Hon in the first game of the second with some superb tennis. The second game saw the girls exchange exciting drop shots before Hon capitalised on some of Hives’ errors to break back and level the set at 1-1. From there the match played out in Hon’s favour, who didn’t drop another game and closed out the match 7-6(4) 6-1. After her win, Hon said it was a tough match against a tough opponent and it was just a matter of hanging in and trying to turn her fortunes around. “I started pretty slow I think, I don’t know why… I had no energy whatsoever,” she said. “I was trying to not show it but it was pretty hard, but I got there in the end. In Saturday’s semifinal Hon will play Abbie Myers, who today managed to overcome her talented 14-year-old opponent Lizette Cabrera in three sets 2-6 6-2 7-6(1). “I haven’t played Myers before but she seems pretty tough so it’ll be good,” Hon said. When asked whether the four-year age difference and experience will make any difference in the semifinal, Hon simply said whoever plays better on the day will get the win. Meanwhile, No.1 seed Azra Hadzic managed to get her tournament back on track following some mixed results in the round-robin stages, confidently disposing of second seed Storm Sanders 6-2 6-2. The remaining quarterfinal match played out between Canberra’s Ashley Keir and Victoria’s Belinda Woolcock went down to the wire, with Keir needing a third and deciding set to claim victory 3-6 6-3 7-5 sealing her semifinal spot. She will play Hadzic on Saturday. You can check updated results, draws and the order of play here.